The beautiful city of York was founded by the Romans in 71 AD and is well known for its beautiful historic architecture. 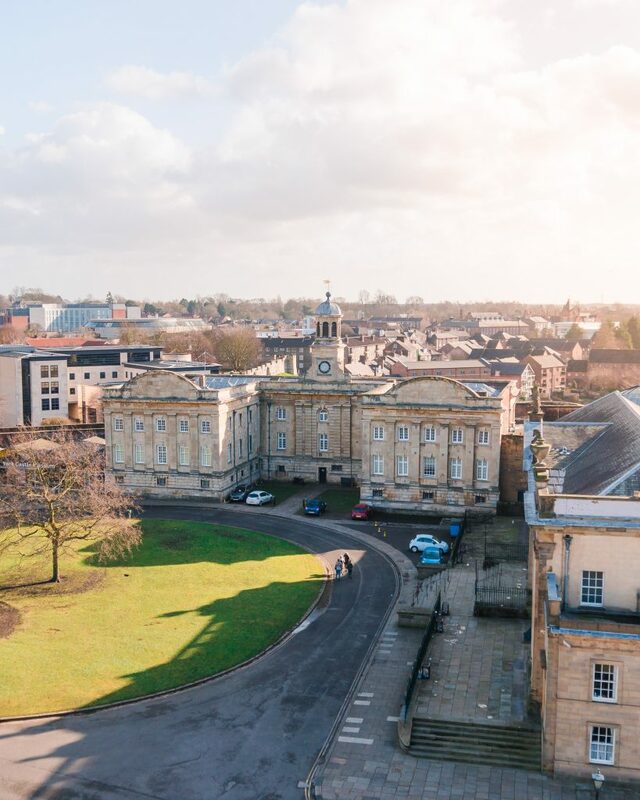 Consistently voted as one of the best places to live in the UK as well as one of the safest cities in the world, York is a perfect place for a weekend break. 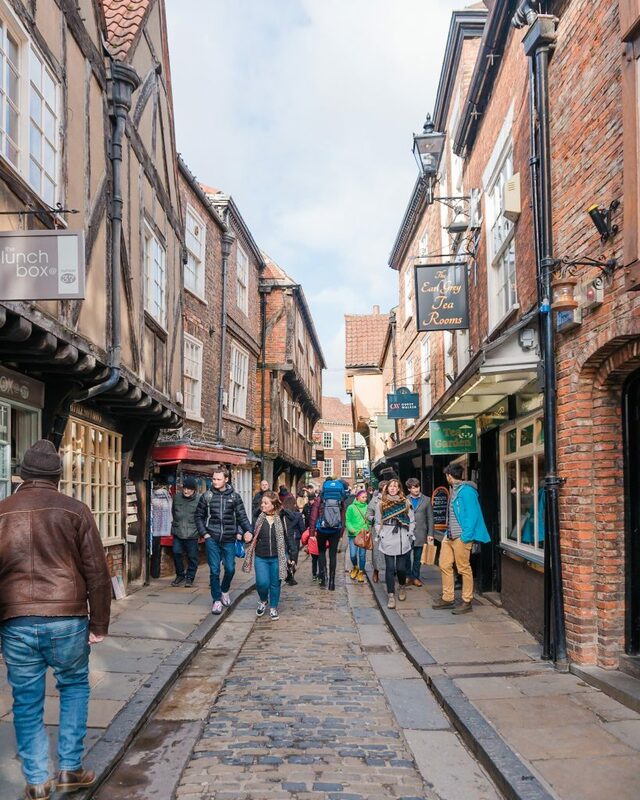 Easily accessible by train from around the country, a weekend in York is easily planned and easily enjoyed! 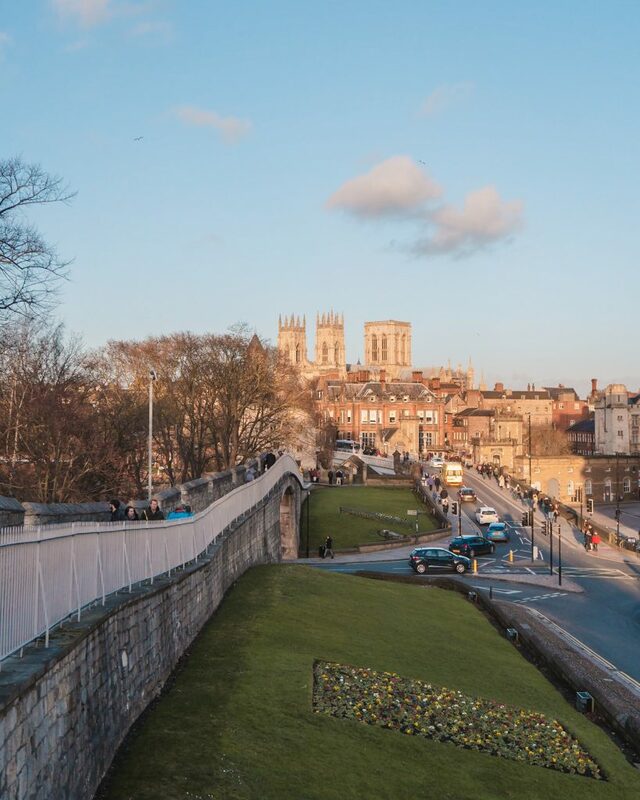 Whether you’re a history buff, a beer aficionado, a coffee fiend or even a trainspotter, York really does have something for everyone. 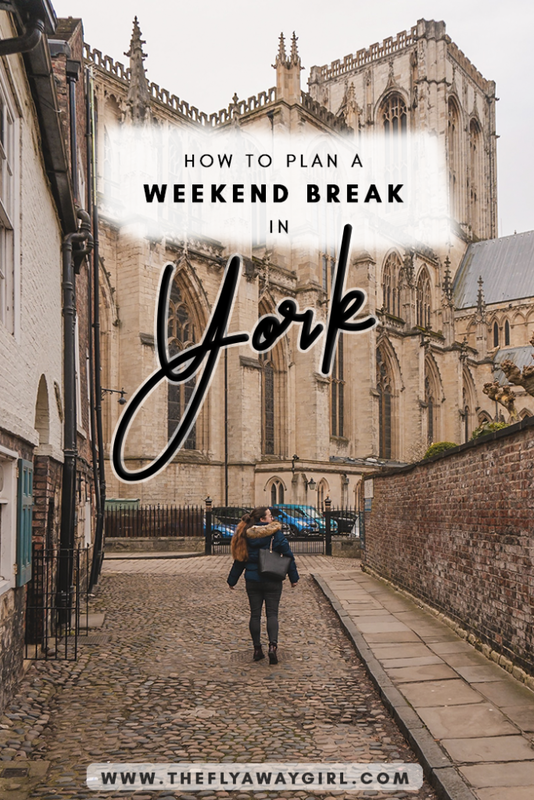 Here are the best things to do during a weekend break in York! Disclosure: I travelled to York as part of a paid campaign with CrossCountry Trains. All opinions are, as always, my own. Settlement in the area that is now York dates all the way back to 8000 and 7000 BC. 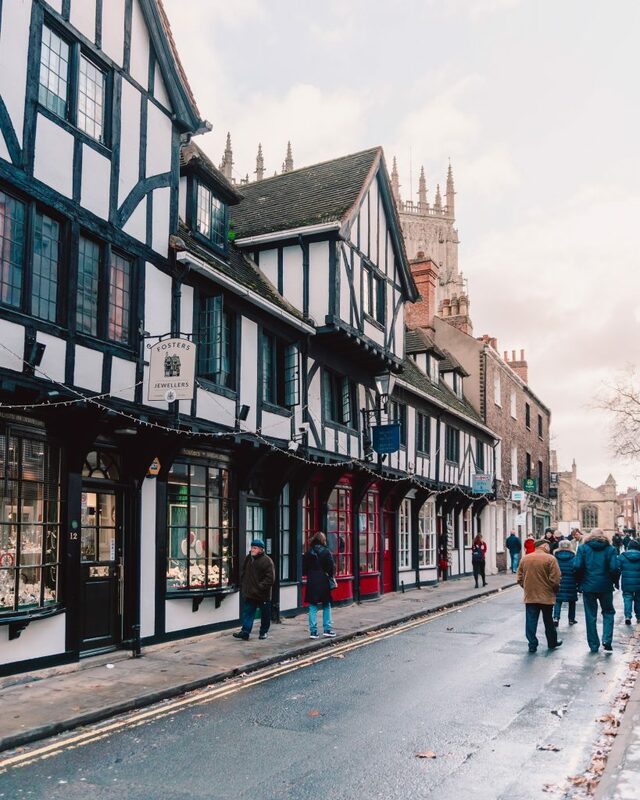 The city of York was then founded in 71 AD by the Romans (as the city of Eboracum) after they conquered the Brigantes tribe that inhabited the area. Famous Roman emperors such as Hadrian (yep, the one with the wall) and Constantine the Great lived in York for part of their reigns. The Angles then settled York in the 5th century. They were a Germanic people and came from the Jutland peninsula (as did the Jutes) that connects Denmark and Germany, including present-day cities such as Flensburg, Kiel, Aarhus and Billund. They called the city ‘Eoforwic’ (pronounced ‘eff-er-which’). The Angles founded some of the kingdoms that made up Anglo-Saxony. The best-known Anglo-Saxon ruler is King Alfred who was King of Wessex and then King of the Anglo-Saxons during the 9th century. If you’re interested in the Anglo-Saxon history of England in a wonderfully dramatized version, watch the Netflix series ‘The Last Kingdom’ that follows Uhtred of Bebbanburg during the 9th century, when Britain was invaded by the Danes. You can also read the novel by Bernard Cornwell, on which the series is based. The Vikings invaded York in 866 and this is where the current name comes from! 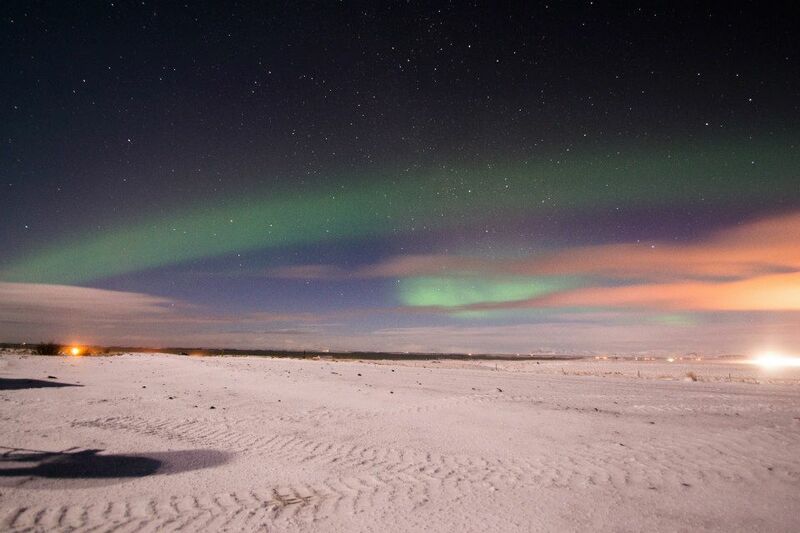 They called the city ‘Jorvík’, an adaptation of ‘Eoforwic’ (wild boar settlement) and using a common Norse/Scandinavian ending ‘vík’ (meaning ‘bay’), making the approximate meaning of the Norse name ‘wild boar creek’ or ‘wild boar bay’. In the 11th century, the Normans conquered England. Building started on the Minster (which then took 250 years to complete!). York developed into a major trading centre and by the 13th century was a major cloth manufacturing and trading centre. The city then declined somewhat during the Tudor rule thanks to events like the Dissolution of the Monasteries but became a significant social and cultural centre in the late 17th century. Railways were brought to York in 1839 thanks to George Hudson and his York and North Midland Railway. The rail connections encouraged businesses to come to York, and the city became the headquarters for the North Eastern Railway, Rowntree’s and Terry’s (two major British confectionary companies). 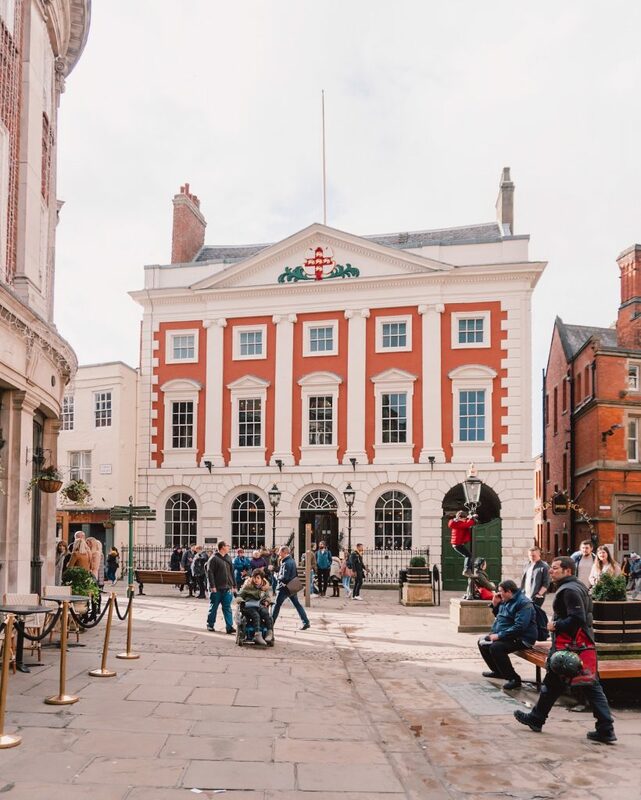 York’s historic centre made the city a tourist attraction from the mid 20th century and tourism remains one of the city’s biggest industries and employers. 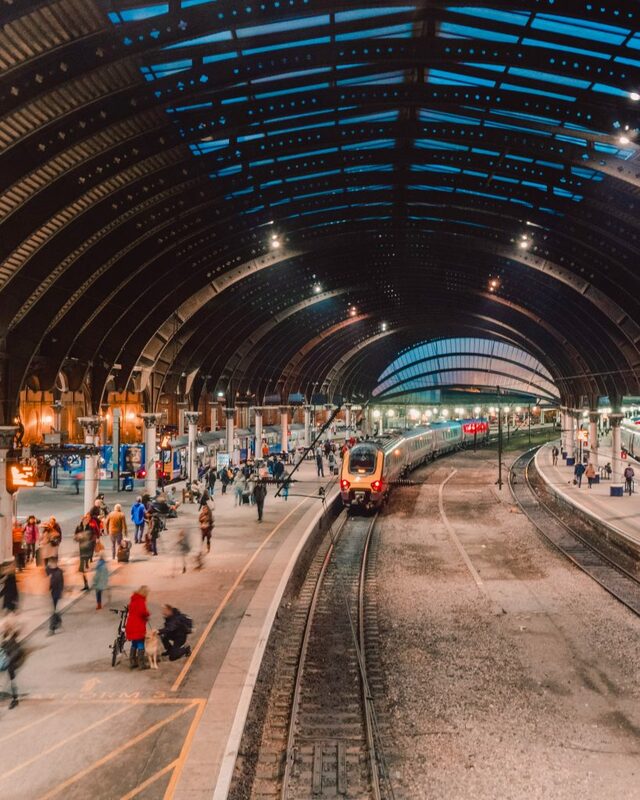 York is extremely well connected to the rest of the country and we travelled to York with CrossCountry trains from Southampton Airport Parkway. The CrossCountry network covers the UK from as far as Penzance, Cardiff, Bristol, Southampton, Birmingham, Edinburgh and Dundee, making it easy to travel to York from almost anywhere in the country. 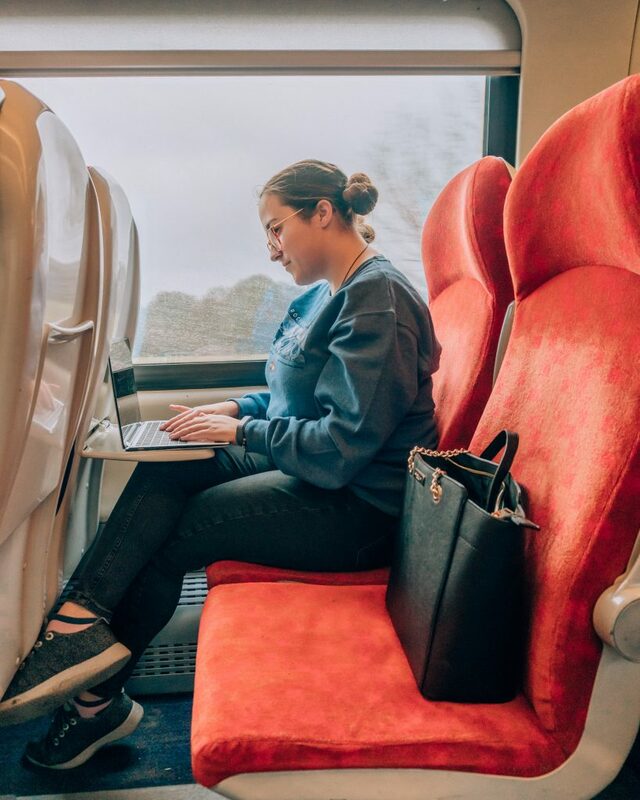 CrossCountry now offers free WiFi on all trains so it’s a great way of getting work done on the journey or simply checking your social media. 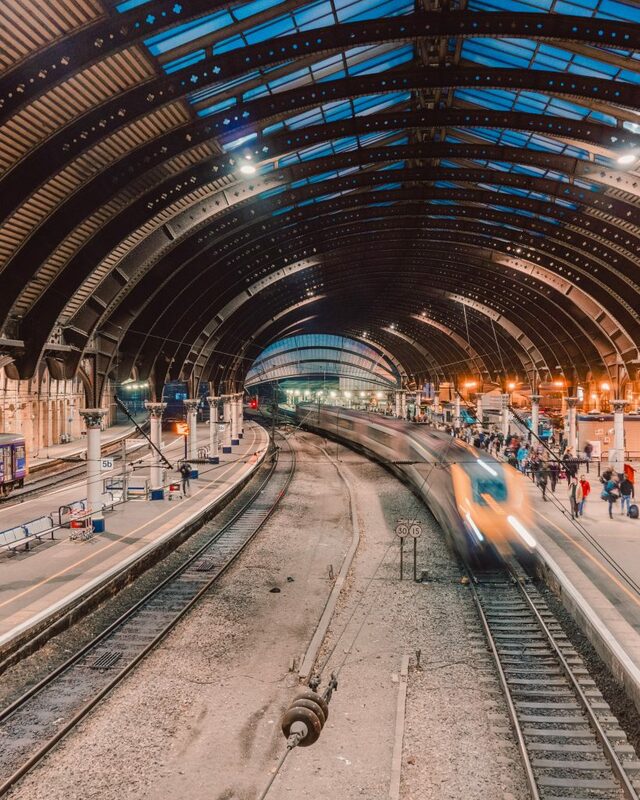 For travelling to York from outside the UK, you can fly to airports like Birmingham, Leeds Bradford or Manchester and get a CrossCountry train to York from there. The closest airport is Leeds Bradford (less than an hour away). Flying into Leeds? 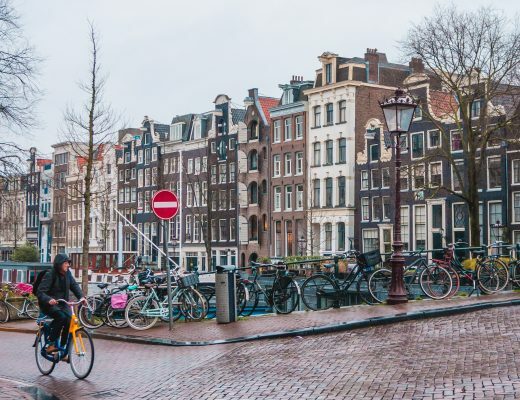 Don’t miss seeing the city while you’re there! 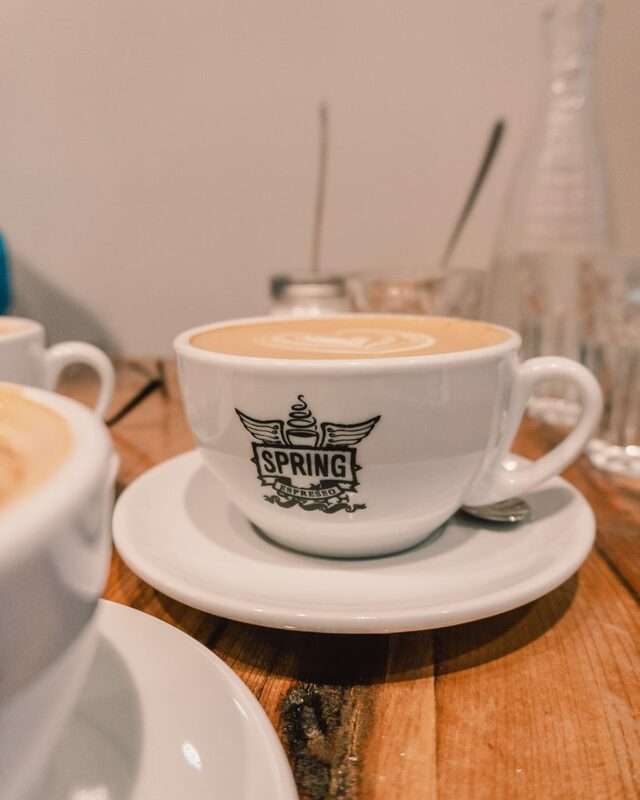 Here are my recommendations for places you can’t miss in Leeds. Birmingham International – York: CrossCountry train Birmingham International to Birmingham New Street (10 min), CrossCountry train from Birmingham New Street to York (2h 30m). 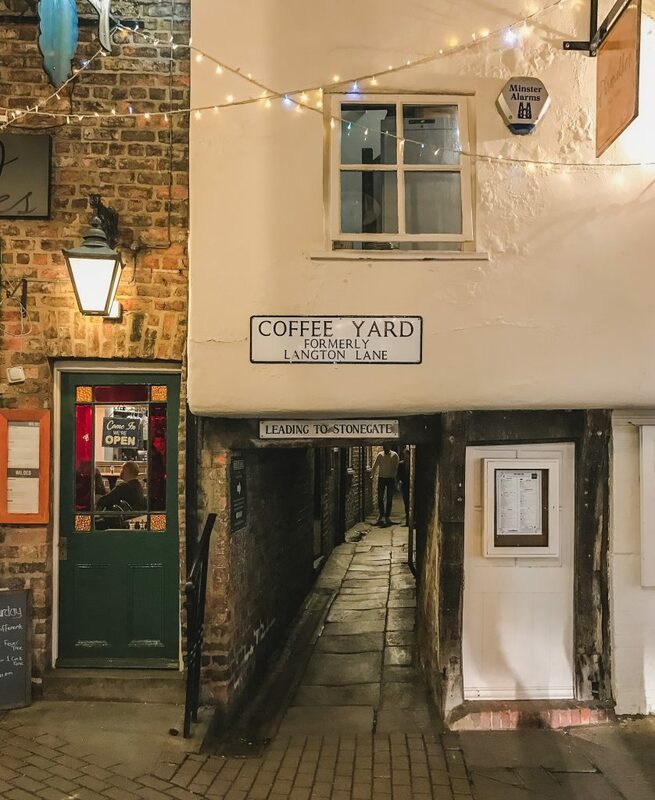 The Shambles is possibly one of the most iconic places in York (aside from the Minster) thanks to its beautiful old-world look. 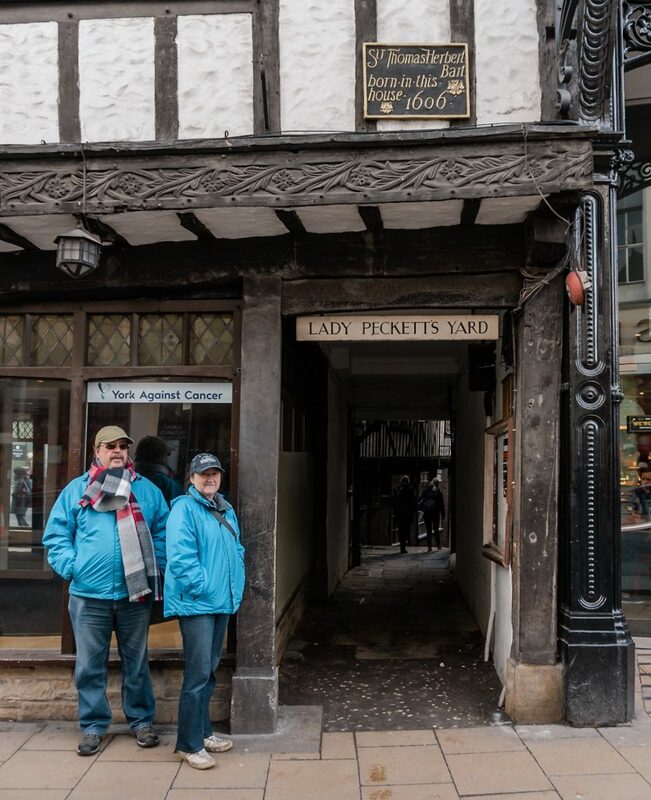 Said to be the inspiration for Diagon Alley in Harry Potter, this old street is always busy with tourists photographing the overhanging timber-framed buildings and exploring the narrow alleyways leading off the street. The original name for the street was likely ‘The Great Flesh Shambles’ (I expect this name would attract far less tourists…), likely to have been derived from the Anglo-Saxon word ‘Fleshammels’ or ‘flesh shelves’. Why such a creepy name? Well, the street was home to many butchers’ shops and even up until the 19th century there were 25 butchers located along the street (although none remain). The ‘Fleshammels’ were the shelves that the butchers used to display their meat, hence the present name of The Shambles. 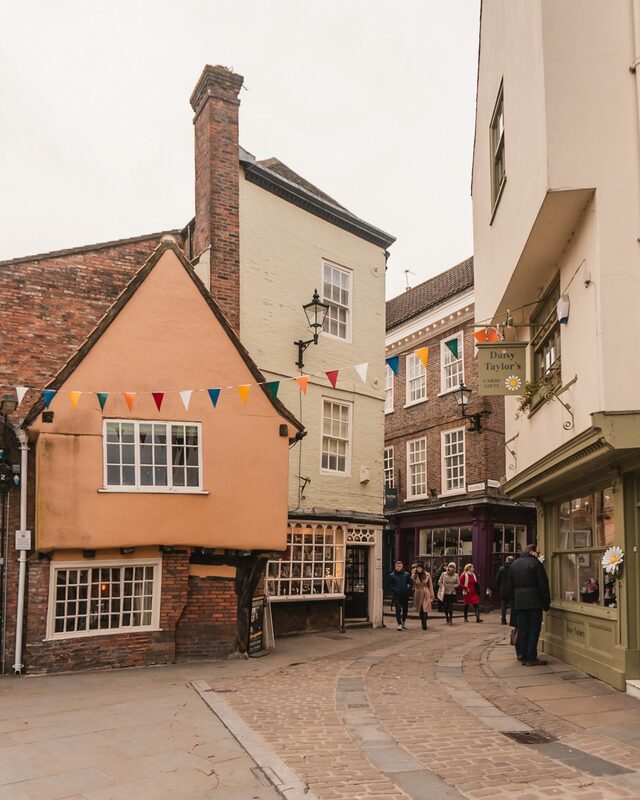 The Shambles has a very long history and was even mentioned in the Domesday Book of 1086. Many of the current buildings date back to the 14th and 15th centuries, so make sure you explore the different buildings! In some you can find out more about residents of The Shambles, such as Margaret Clitherow at No. 35, where she lived and her husband had his butcher’s shop. Saint Margaret Clitherow, also known as the ‘Pearl of York’ is a martyr and saint and was imprisoned for being Roman Catholic and eventually crushed to death (while pregnant with her fourth child) for illegally harbouring priests in her house. 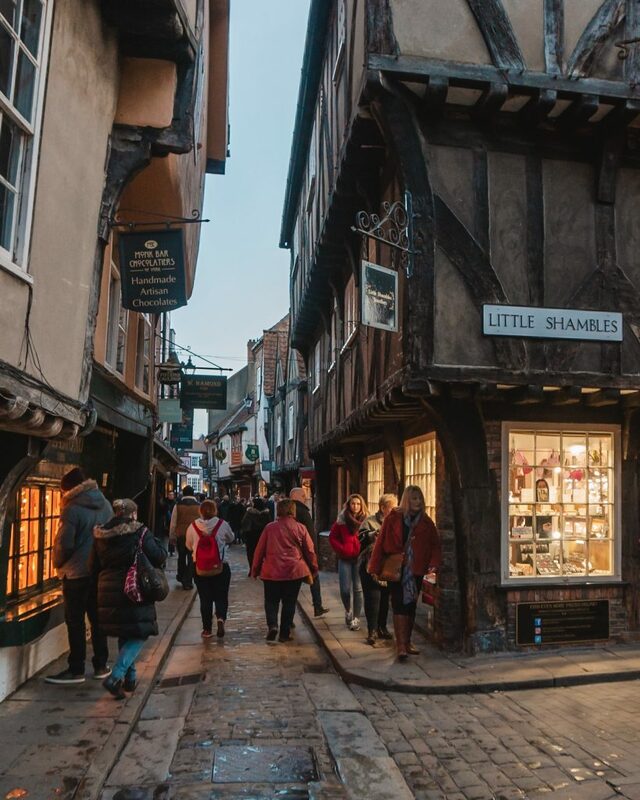 Don’t forget to explore the ‘snickelways’ that lead off The Shambles, as well as the Shambles Market, which occurs daily. So, what is a snickelway? It’s an odd name, coined by local author Mark W. Jones in 1983 for his book ‘A Walk around the Snickelways of York’. He created the neologism from the words ‘snicket’ (passageway between walls or fences), ‘ginnel’ (a narrow passageway between or through buildings) and ‘alleyway’ (a narrow street or lane). Even though snickelway is a made-up term, it quickly became part of the local vocabulary and is even used in official council documents to refer to these streets. 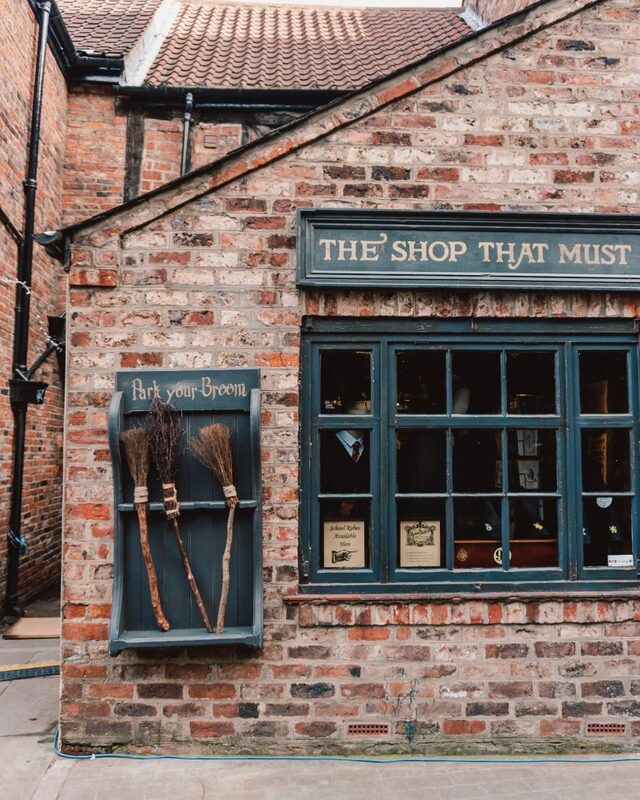 One of the many Harry Potter inspired shops along The Shambles! Jones’ official definition of a snickelway is “a narrow place to walk along, leading from somewhere to somewhere else… in the city of York”. Generally, they are small paths or lanes between buildings, not wide enough for a vehicle to pass down but are public rights of way. Jones’ book documented a walk that included 50 snickelways within the city walls – how many will you discover? One of my favourite snickelways is the beautiful Lady Peckett’s Yard, named after the wife of a former Lord Mayor of York. You could easily miss the entrance if you didn’t know it was there as it is located pretty much underneath a building, to the right-hand side of a store. 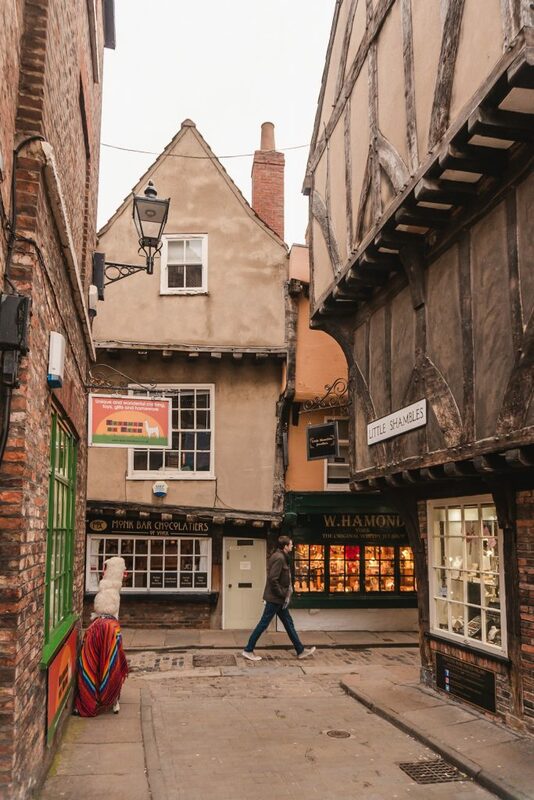 This narrow alleyway is a great spot for a photograph of York without too many people in – you get to see the stereotypical timbered house on one side (like you do at The Shambles) without all the other people getting in your photo. Win! My other favourite snickelway is Coffee Yard (solely for the name), which is actually the longest snickelway in the city at 220 feet or 67m long. Other notable snickelways are Hole-in-the-Wall, the shortest snickelway in the city, as well as Mad Alice Lane (named after a woman who was hanged in 1823 for poisoning her husband), Pope’s Head Alley (only 2 ft 7 inches or 79cm wide) and the beautiful Grape Lane (which was renamed from ‘Gropecunt Lane’, which always makes me laugh). 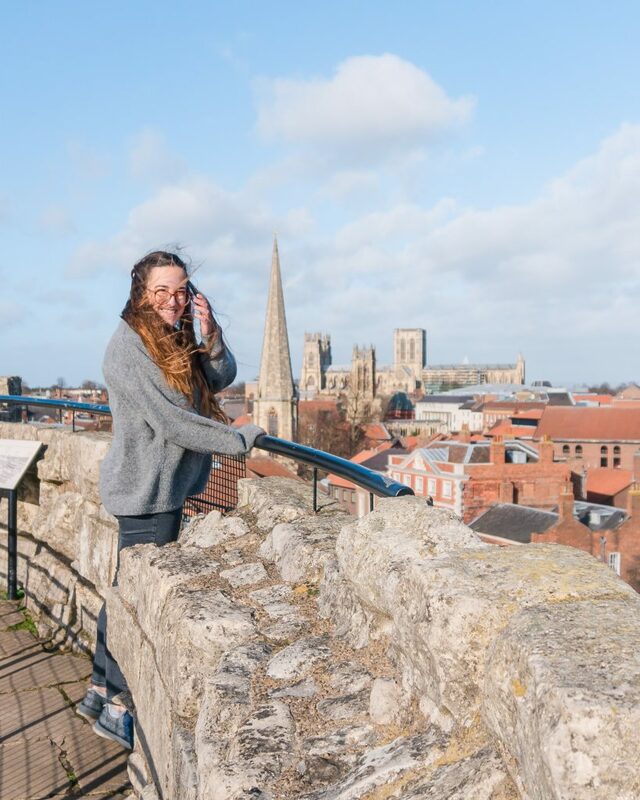 If you’re looking for the best view over the city of York then look no further – it’s definitely from Clifford’s Tower! Clifford’s Tower is part of York Castle, a fortified castle complex that consists of prisons, law courts and other buildings. 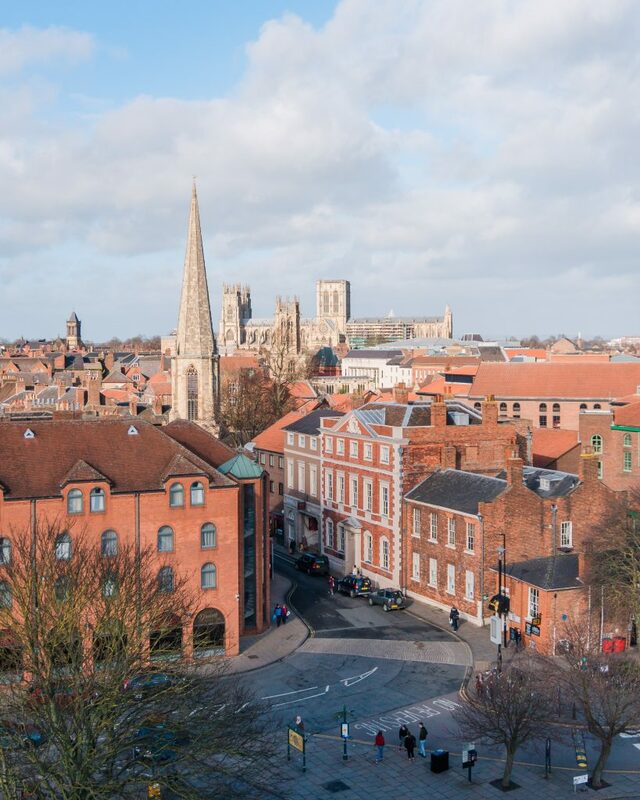 From the tower, you get a great view over the city including all the way to York Minster. It was a little breezy when we went!! The tower was the former keep of the medieval Norman castle and was the site of a pogrom in 1190. 150 local Jews were killed when anti-Jewish sentiment was inflamed due to Richard I announcing his intention to join the Crusades. A local man who owed money to a powerful Jewish merchant exploited an accidental house fire to incite a mob to attack employees of the merchant. The local Jewish community sought refuge in the keep of the castle but the mob surrounded the castle and then laid siege to the castle. The Rabbi proposed an act of collective suicide in order to avoid being killed by the mob. The few Jews who did not commit suicide and instead surrendered (and promised to convert to Christianity) were killed by the mob. While some parts of the history of Clifford’s Tower are less than pleasant, it is a really interesting place to visit in York. It is now managed by English Heritage and entry costs £5.40 for adults, £3.20 for children, £4.90 for students and it is free for members of Engish Heritage. 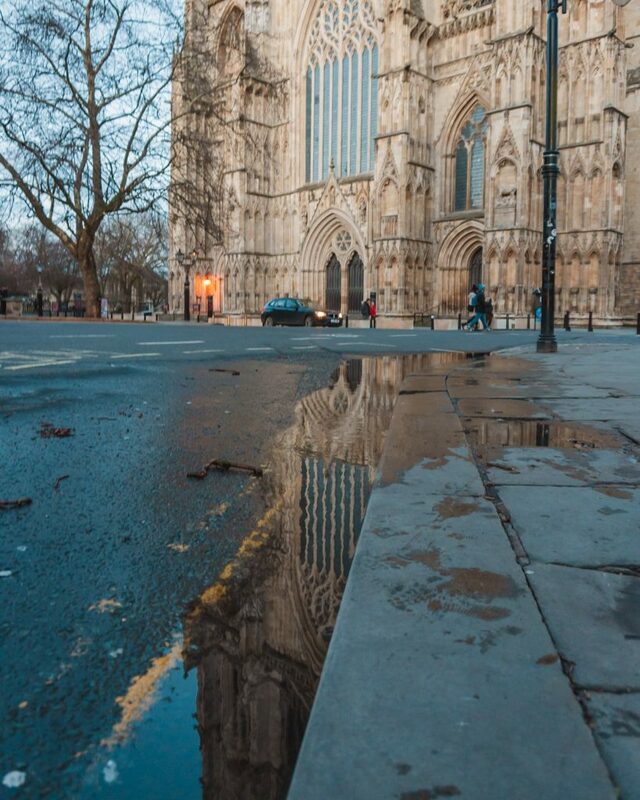 Probably the most iconic sight in York is York Minster, the cathedral of the city. The site of the minster has been home to a church since the 7th century and the current building was constructed from 1230 to 1472. The minster has a total of three towers, the tallest of which is 235 feet (72m) high. 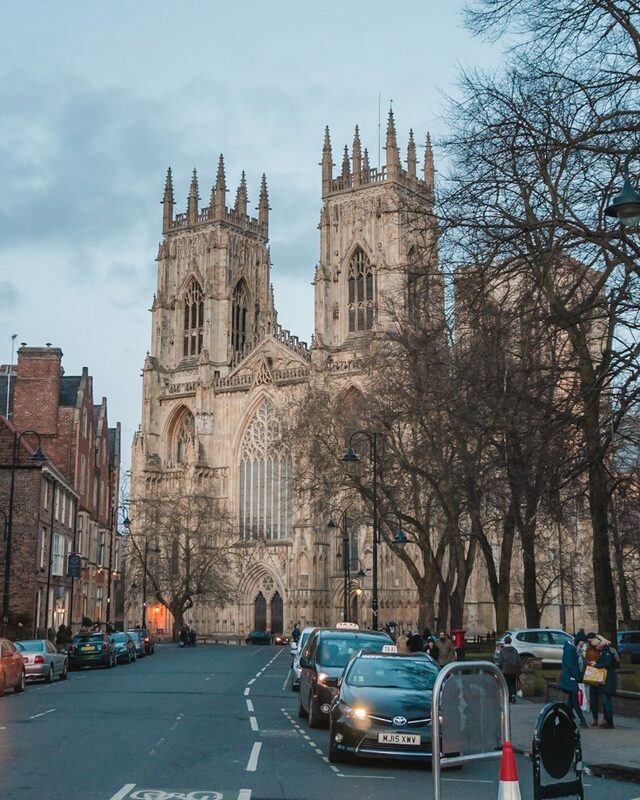 Unfortunately, we were unable to visit the inside of the minster on this trip since we visited on a Sunday, and visiting times don’t start until 12:30pm which was after our train departed. However, we have been inside before and the interior is spectacular! You can also get a really nice view of the minster from Chapter House Street, by the Treasurer’s House and St William’s College. Most people miss this side of the minster so you can get a great shot with no one in it! You can choose to either visit the Minster only or see the Minster and do the tower tour. If you are able to climb the 275 steps then I would highly recommend doing the tower tour on your visit! This was one of our first stops in York because it was really close to where we were staying at Georgian House B&B. This ruin of a Benedictine abbey is well worth a visit, as are the nearby museums and buildings. 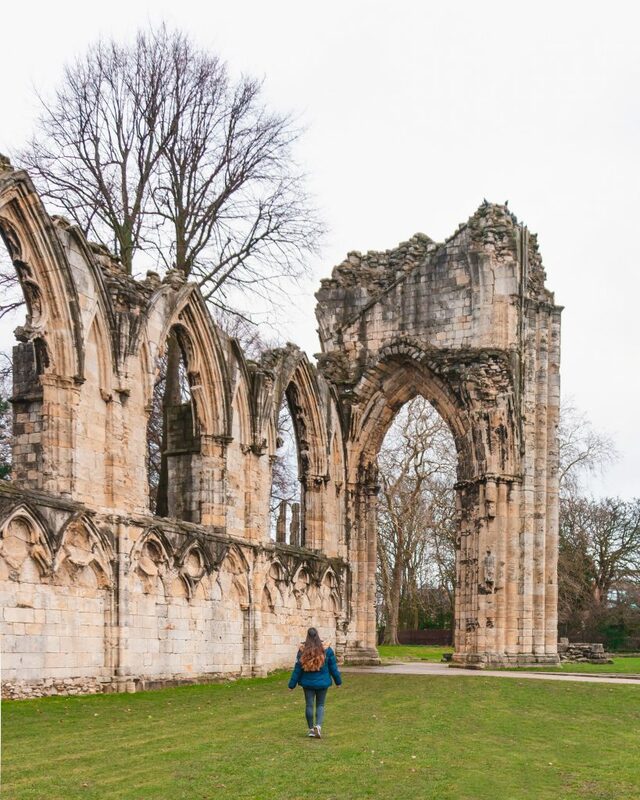 This abbey was once the richest abbey in the north of England and is located in what is now the York Museum Gardens. During the Dissolution of the Monasteries by Henry VIII, the abbey was closed and substantially destroyed. In 1539 the abbey surrendered £2,085 to the crown – the equivalent of over £1.3 million today. The York Museum Gardens are also home to the Yorkshire Museum, the ruins of the corner tower of the Roman fort of Eboracum, The Hospitium (where low ranking visitors to the abbey would have stayed) and St Leonard’s Hospital, a 13th-century hospital and chapel that was operational until the abbey was closed down. The Museum Gardens are completely free to visit and are well worth a wander to see the ruins and the botanic garden, best seen in spring or summer. The Yorkshire Museum houses collections on botany, biology, geology, astronomy and archaeology. Entry is £7.50 for adults, £4 for adults 17-24 and children under 16 go free. If you are expecting to visit other museums as well (York Castle Museum and York Art Gallery), then the YMT Card may be a better choice. The YMT Card is £22 and valid for a full year (£11 for those aged 17-24). 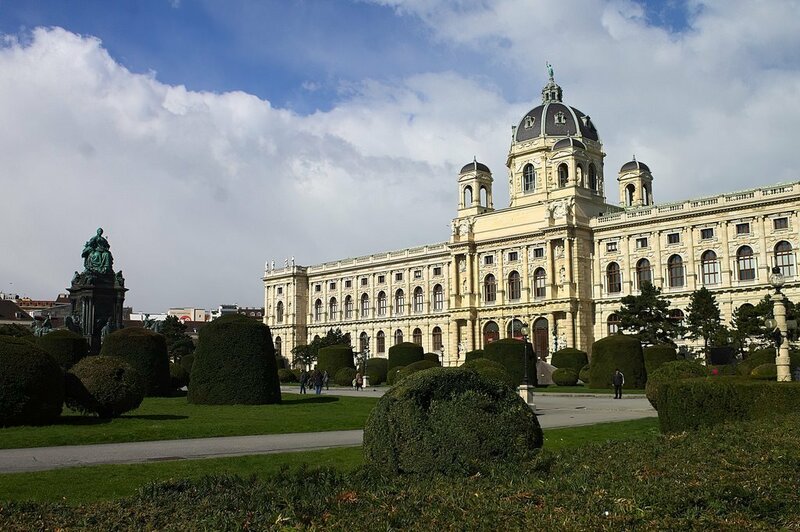 You can purchase the card at the admission desk of any of the three museums. 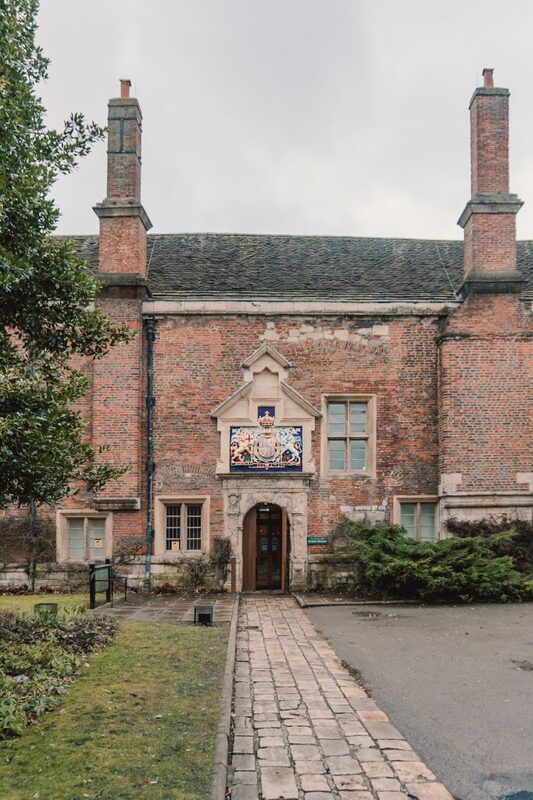 Another building just by the York Museum Gardens – this beautiful facade is part of the University of York and is home to their architecture department! 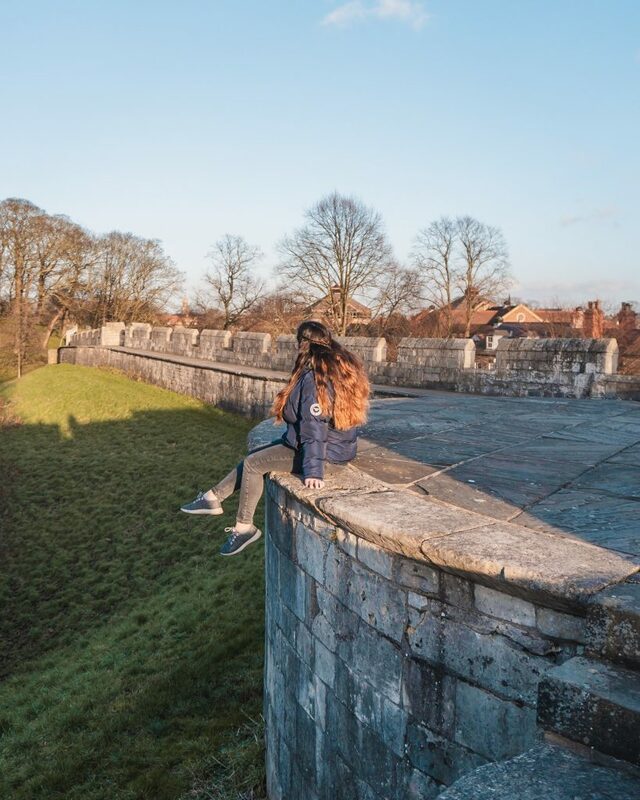 You definitely can’t miss walking the York city walls! 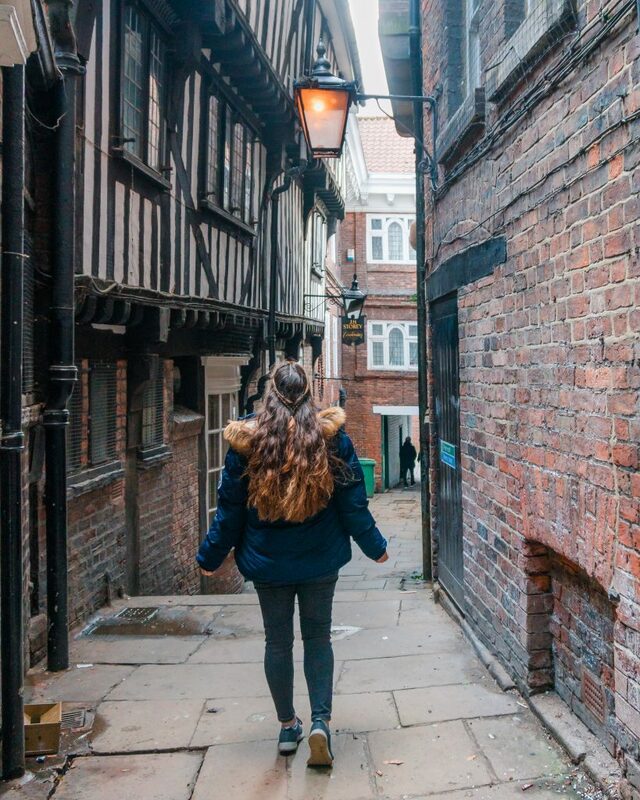 York has the most miles of intact city walls in all of England so you definitely need to make time during your weekend in York to walk at least part of them. There are four main gates (or ‘Bars’) along the walls, which are Bootham Bar, Monk Bar, Walmgate Bar and Micklegate Bar. Micklegate Bar, from ‘mykla gate’ in Old Norse meaning ‘Great Street’, is probably best known as it was the traditional ceremonial gate for monarchs to enter the city through. You can walk as much or as little of the city walls as you want, and we walked from Baile Hill via the wonderfully named ‘Bitchdaughter Tower’ (I laughed out loud on the train when I found out that was its name), Victoria Bar, Micklegate Bar, past the railway station and finished our walk with the iconic shot of the Minster over Lendal Bridge from the walls. The walls are completely free to walk and are generally open year round from 8am until dusk unless weather conditions make them impassable (e.g. ice or snow). If you want to do the entire walls walk then this will take you around 2 hours total. We walked approximately 1/3 of the walls, the entire section on the southwest side of the River Ouse. 8 Gillygate, York, YO31 7EQ. This was possibly my favourite brunch spot in York! 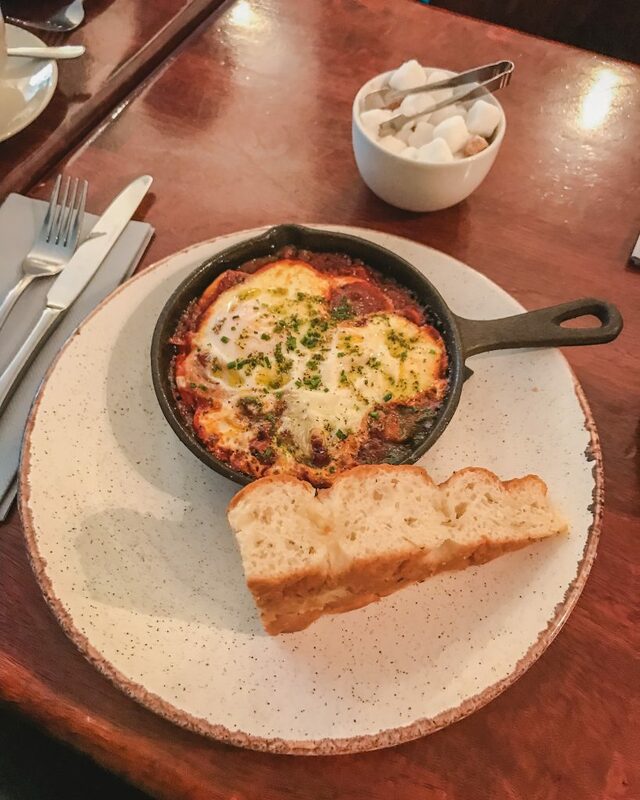 Their baked eggs (shakshouka) with halloumi and the eggs benedict with bubble and squeak were so good, plus the coffee was excellent as well. This was just down the road from where we were staying so the perfect spot for breakfast! They also offer an excellent dinner menu (including slow-cooked lamb shoulder and ham hock terrine) and an extensive wine menu. Their Sunday Lunch menu looks amazing too! 3a Castlegate, York, YO1 9RN. 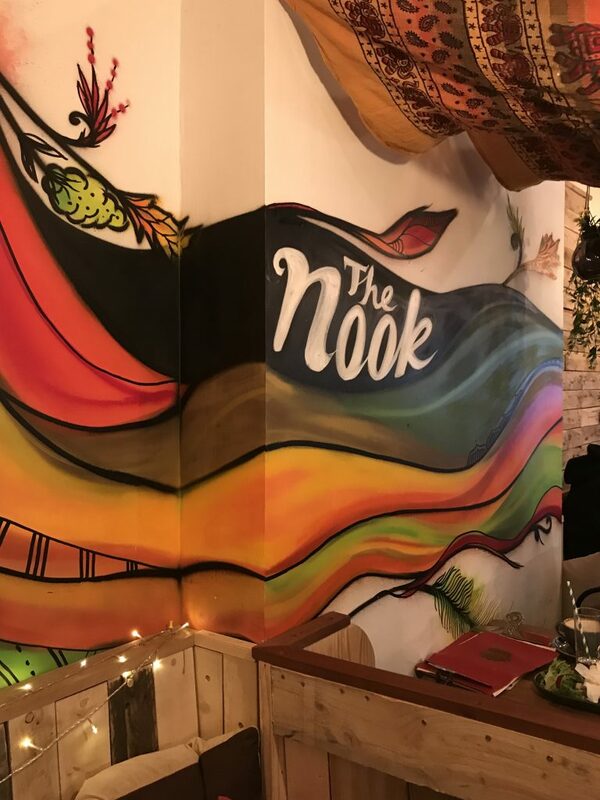 The Nook was an accidental find for us but well worth it! Describing itself as a ‘street food cafe’, they offer absolutely delicious lunchtime goodies (all £8!) such as a steak sandwich with Roquefort, pork belly bao bun with sriracha mayo and a toastie with Yorkshire cheese and Lancashire cheese. They also have a great cocktail menu if you visit in the evening and often have a two for £9 deal on offer! 78 Low Petergate, York, YO1 7HZ and 4 Stonegate, York, YO1 8AS. While yes, the York Roast Co is a little touristy it’s also really good! You have the option of multiple roast options either as a roast dinner in a giant Yorkshire pudding or as a YorkyPud wrap. Choose from pork, turkey, ham or beef as a wrap or sandwich or pork, turkey, ham, beef or vegetarian as a Yorkshire Pudding Meal. It’s a great spot for an inexpensive meal! 21 Lendal, York, YO1 8AQ and 45 Fossgate, York, YO1 9TF. Possibly the best coffee in York! They now have two spots in the city and we went to the Lendal location as I had read it was slightly less busy than the other one. We waited about five minutes for a table still but it was well worth it! Their mocha was delicious and they have lots of cakes and breakfast goods as well, including avocado toast, pancakes and porridge. If you’re there around lunchtime, they also offer a variety of sandwiches including cheddar and ham, goats cheese, halloumi and hummus, pastrami, chicken and avocado, chicken and bacon and brie, bacon and cranberry. 5 Museum St, York, YO1 7DT. Seriously delicious brownies! They have both a cafe and a bakery on the same street, just a few doors apart. They also offer bigger dishes like pancake stacks, porridge and poached eggs. The brownie offerings vary depending on the day and the time you visit – I enjoyed a delicious Bourbon brownie (the biscuit, not the alcohol!) when I went. Yum! Find Brew & Brownie just steps from the impressive Mansion House! Unit 6, Enterprise Complex, Walmgate, York, YO1 9TT. 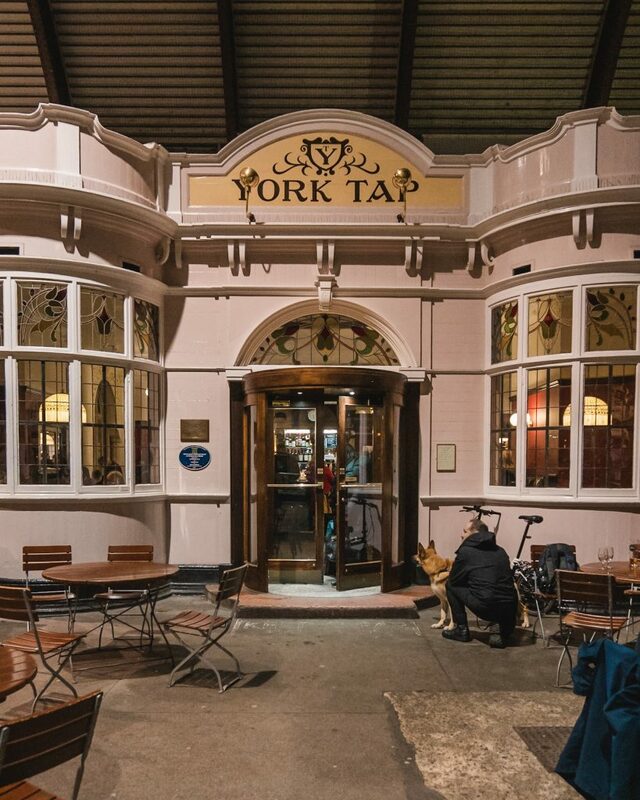 This pub is the taproom of Brew York, one of York’s two breweries. It’s generally pretty busy but has lots of options to choose from! In the summer there is also a beer garden on the banks of the River Foss where you can relax with a good beer. Railway Station, Station Road, York, YO24 1AB. Yes, that’s right, this pub is located IN the station. It was our first stop on arrival since our train came in around 5pm. It’s also housed in a Grade 2 listed Edwardian building so it’s a great place to check out anyway. They offer their own beers (from the Tapped breweries in Sheffield and Leeds), as well as local beers and ones from around the country. 6 Patrick Pool, York, YO1 8BB. Pivni is a craft beer bar located in a 3-storey 16th-century townhouse, just on the edge of the Shambles Market. They have five cask taps with rotating beers from across the UK and a range of keg beers, as well as a selection of Bernard Czech lagers. For those less interested in beer, they also boast a decent wine list and have cider on offer as well. We stayed at the lovely Georgian House & Mews which was just a short walk from the centre of York. 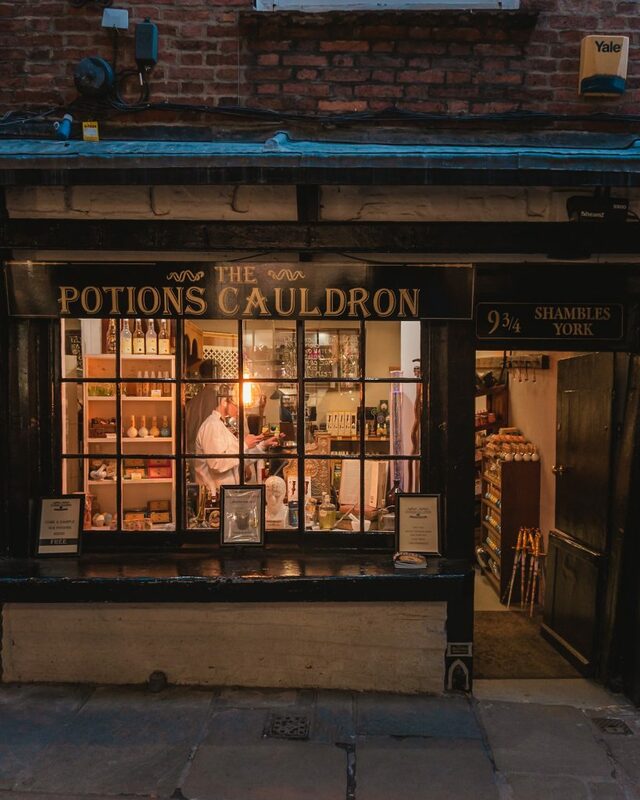 It’s well located just steps away from Bootham Bar, one of the main gates in the city walls. 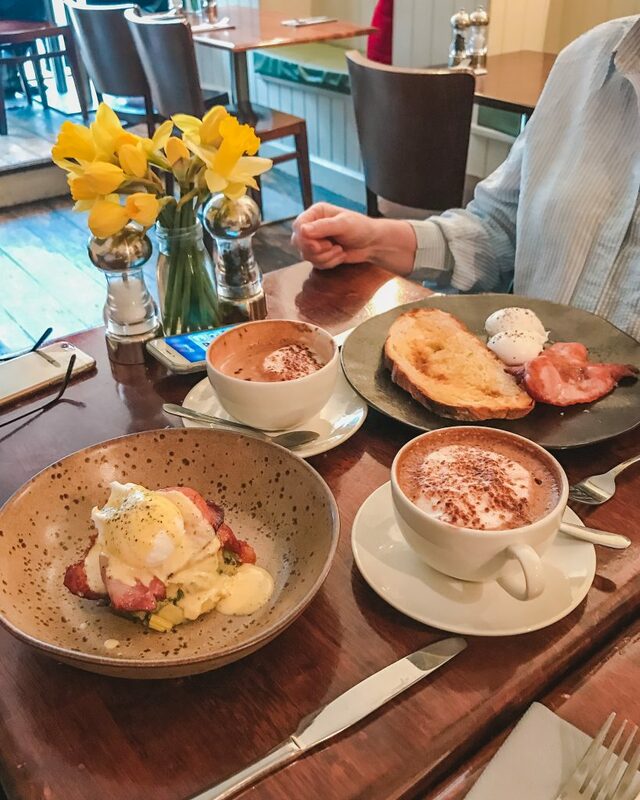 They also offer a good breakfast and have lots of options for those with allergies or intolerances, just let them know and they are really good about providing alternatives! 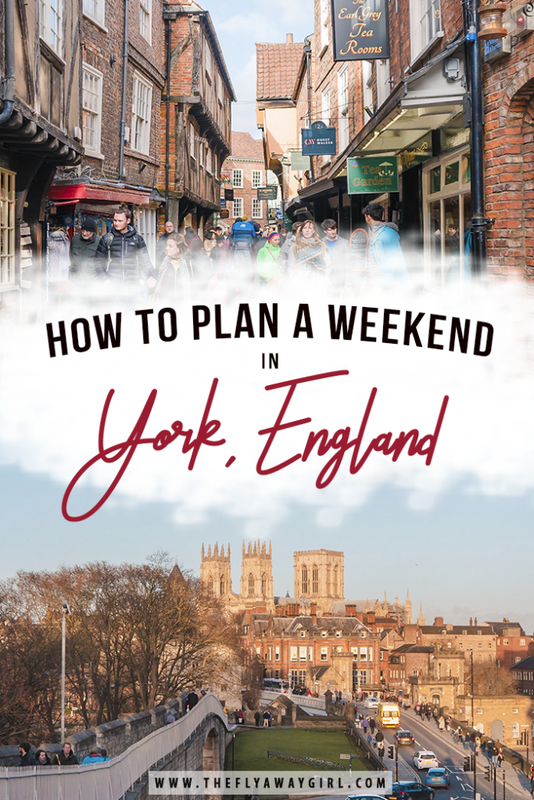 I hope this guide has helped you decide how best to spend a weekend in York! 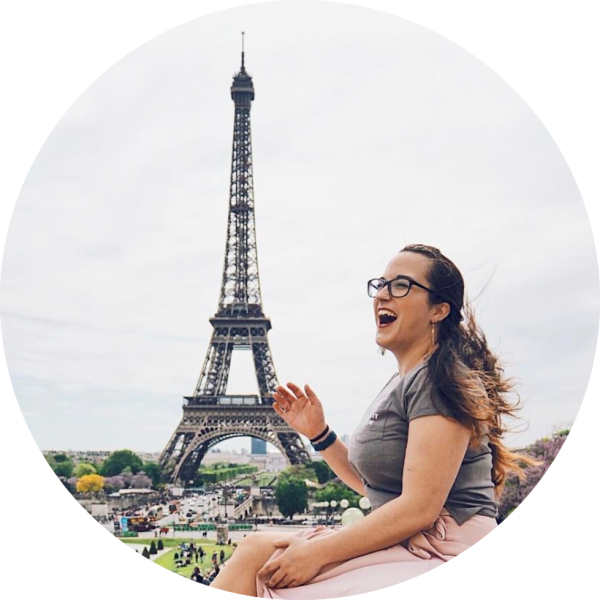 There is seriously so much to do in the city but these are my top picks for a weekend break. 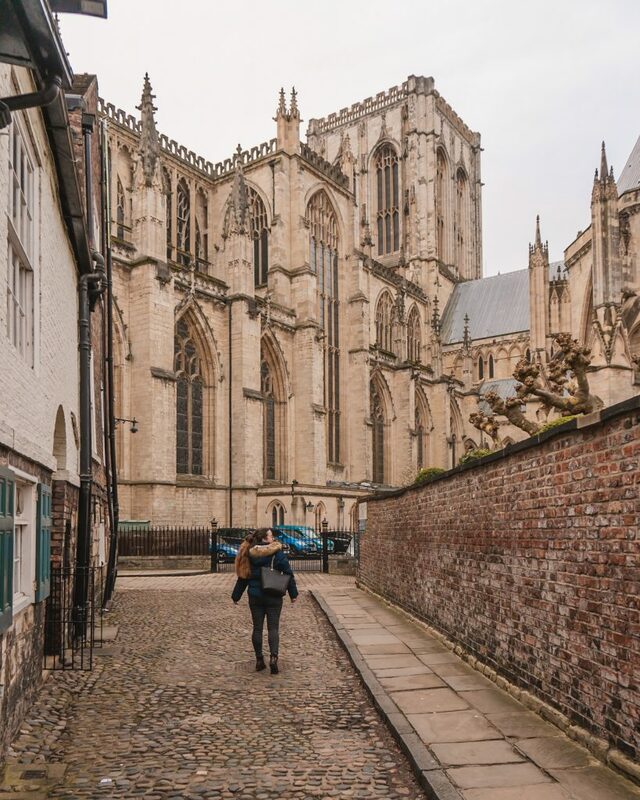 Let me know in the comments if you have been to York and what your favourite things to do were!